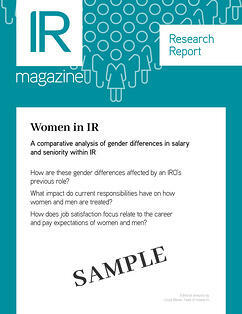 How are these gender differences affected by an IRO's previous role? What impact do current responsibilities have on how women and men are treated? How does job satisfaction focus relate to the career and pay expectations of women and men? You can download your free sample of this report by entering your details on the right. The sample will be sent to the email address you provide. Interested in downloading the full report? To access the full report, plus all our reports throughout the year and lots more great IR content, you'll require a subscription to IR magazine. Take a look at our subscription page to find out more about what's included, or contact our subscriptions manager, Paul Campbell by email or at +44 20 8004 5337. Copyright IR Media Group Ltd. 1995 - 2017 All rights reserved.